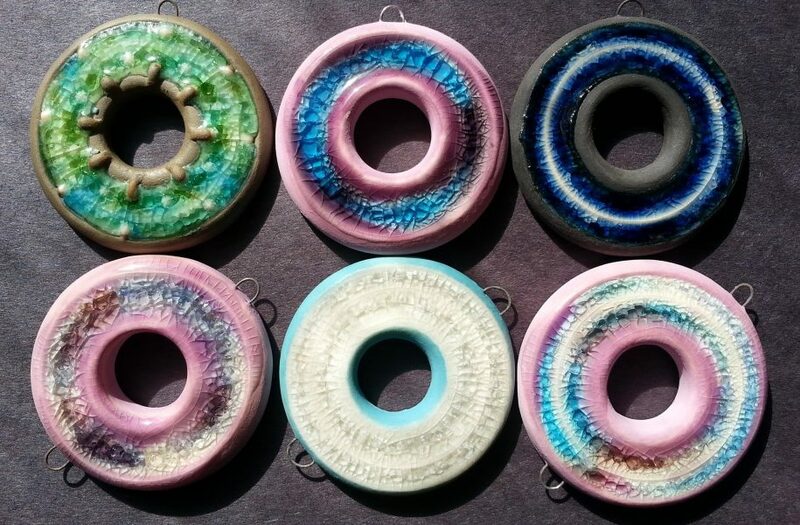 This months Art Elements component challenge was a little different as out components were contributed by a guest designer Kristie Roeder, who provided this gorgeous selection of ceramic and glass pendants. I managed to snag the lovely aqua green one top left. I really wanted to bead embroider this but it’s a rather large piece and I knew I would get carried away and end up with it being unwearable. So I either had to treat it as decorative art or pare it down somewhat – I chose the latter. The pendant itself is so stunning it really doesn’t need very much to make it shine so I’ve kept it really simple. 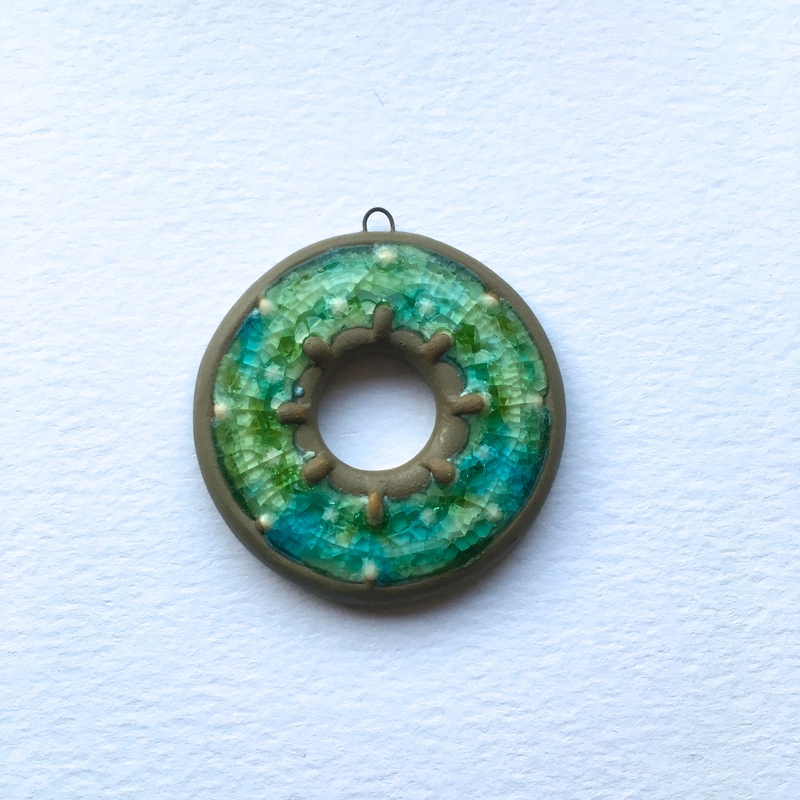 The pendant has a loop attached but I decided I wanted to create a beaded bail so I started off by flipping it and adding a lampwork headpin by Jen Cameron to the loop. I then threaded some very fine wire with seed beads and wrapped it around the loop. The bail was created by threading seed beads onto Fireline and wrapping it around the pendant three times. Add some toning 3mm leather cord, choker length and there you have it…a simple but striking statement piece. Huge thanks to Kristie for sponsoring this challenge and for the opportunity to design with her work. I hope you will use the links below to check out the designs made by the other participants. I love the colors and the design! Lesley, I adore that lovely dangle you made by embellishing the intended connection point. So very creative. That gorgeous! I love all the little bits of colour, they work so well together to make a stunning piece! Wow! You brought out the colors so well! I love it! Thank you so much for doing this! Gorgeous bead you got, and I love the way you made the bail! Perfect! I love the variety of uses that these seemingly simple pieces have been put to! Your take is stunning. Wow. I could dive in. The silver lined seed beads in the bail really stand out and mirror the dotted edge in the clay. Gorgeous palette. It came together beautifully Lesley! Stunning! What I really loved was how you covered the loop. I ADORE this piece! The colours are perfect and I love that you did some thing unexpected with it a real stunner! 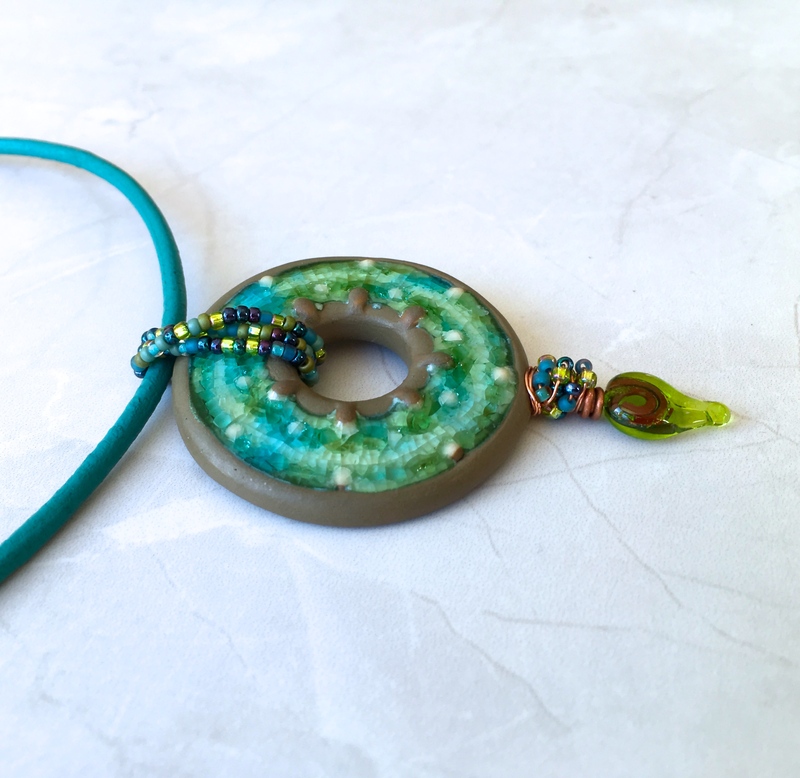 The pendant you received is just gorgeous… LOVE the colors! I never would have thought to flip the piece the way you did. So smart and fun! I love the fairly simple treatment that lets the focal shine. Love this piece! The colors are gorgeous and I love how you treated the bail as well as the way you used the original loop for hanging the beads at the bottom. Clever design!